The Dark beer from Hof Ten Dormaal is a Saison or Farmhouse Ale brewed with toasted malts for a darker body and bolder sweetness. The beer pours a hazy, woody brown. It is unfiltered with a murky appearance, packed with floating yeast sediment. 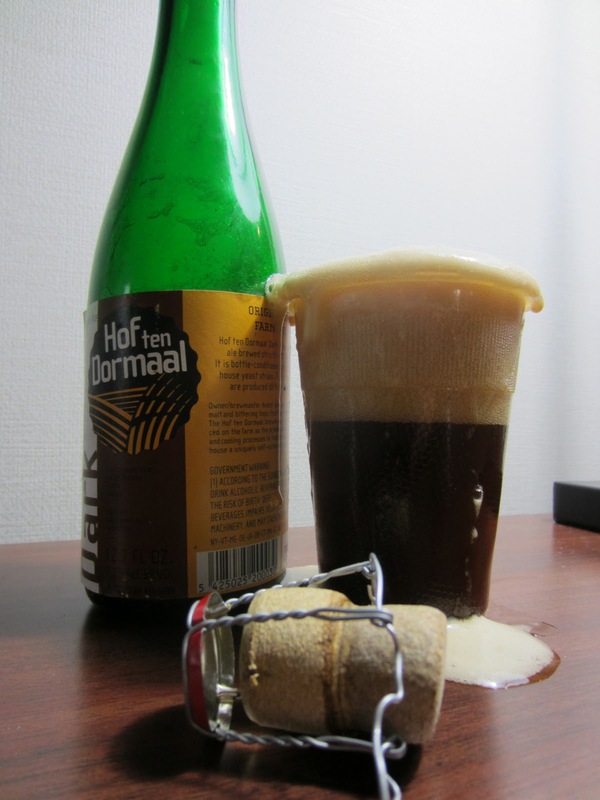 The beer sports a thick tan head of sticky foam with excellent retention and elegant lacing. The nose is earthy with minor coffee-like notes juxtaposed against a sour, pungent air common among the style. Crisp carbonation gives the beer a tight mouthfeel. Malted grains seem coarse and slightly earthy with hints of decomposing wood. Cellary yeast and ample spicy elements give the beer its defining Farmhouse heritage and contrast the almost Bock-like malt profile. Fairly boozy on the finish, the beer finishes warm with lasting caramelized sweetness and spice. Not a style I've had before, I'd like to try more dark Saisons. I found it very interesting how the style is able to absorb the toasted malts while prominently featuring the best parts of a brown beer and a Saison at once.